While it may be easy to heat up leftovers in that reused butter container, be careful; reheating in plastic isn’t your safest bet. 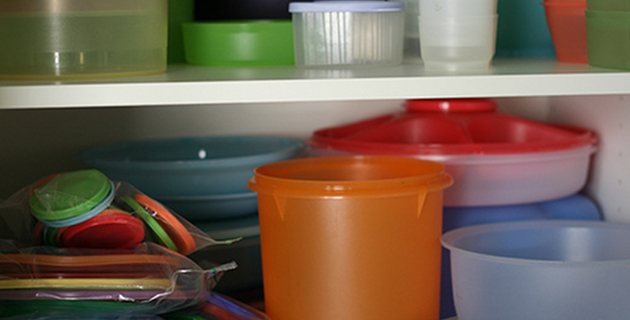 BAD: Common food-grade plastics, such as yogurt containers, margarine tubs or disposable plastic plates, are FDA-approved but have not been tested for use in microwaves. If they are microwaved, they may release chemicals that can interfere with hormones into food – especially fatty foods. Furthermore, heated food can melt them, posing a risk of burns and scalds. BETTER: Those plastic containers labeled “microwave-safe” won’t melt or crack, and they have been tested under typical conditions of use to see if chemicals in plastic wind up in food. Any chemicals that leach into food appear at levels far below those shown to have any health effects. Still, even “microwave-safe” # 7 poly-carbonate plastic should be avoided, since it leaches hormone-disrupting bisphenol A, especially when heated. And “microwave-safe” plastic can bubble, scratch or degrade over time.